Despite looking rather like a jellyfish this salp is a member of the Tunicata, a group of animals also known as sea squirts. 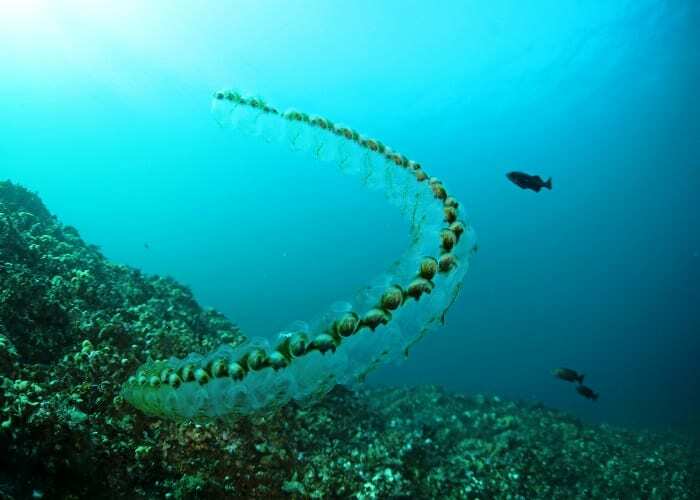 Salps feed by filtering plankton and algae and move using an incredibly efficient jet propulsion system. Larval sea squirts have a notochord running down their back, a tough, flexible rod which protects the central nerve cord and provides and attachment point for muscles. Adults lose their notochord as they grow, but it is one of the ways we can tell that sea squirts are the closest living relatives of the vertebrates – all animals with backbones. This is the group that includes fish, amphibians, reptiles, birds and you, and you can read more about that in Specimen of the Week 267. 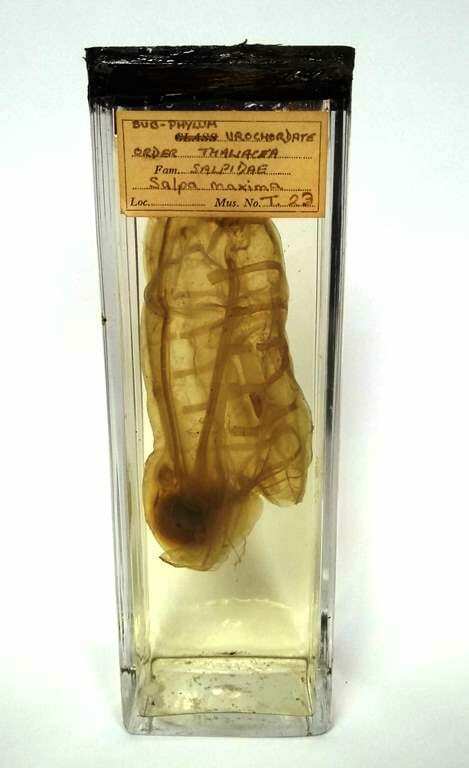 The sea squirts we have blogged about before have been happy to stay stuck to the sea floor, but this salp was more of an adventurous seafarer. And its love life? Let’s just say it’s complicated. To human eyes the salp life-cycle can seem a little convoluted, but they have all the bases covered – male, female and asexual phases with alternating communal and solitary life styles. 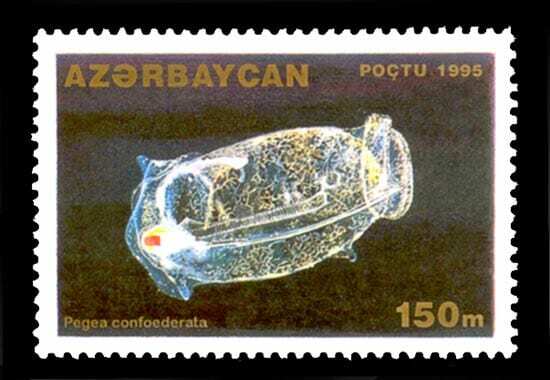 Adult salps have an asexual phase called the oozoid and a sexual phase called the blastozooid. When it is ready to reproduce the solitary, asexual oozoid buds off clones of itself in long chains of salps. The salps in these chains develop into sexually reproducing blastozooids. First, the whole chain is female and all the individuals produce eggs that become fertilised by any male blastozooids nearby. The eggs develop internally and the salps give birth to live young that swim off to grow and develop into asexual oozoid adults. Finally the whole chain of salps become male and release sperm which fertilises the eggs of any nearby female blastozooids. Simple right? 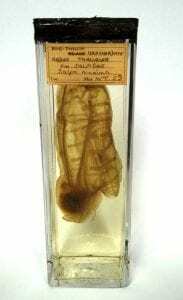 Our salp is a sexual blastozooid form, like the ones in this image. Although they have a complex life cycle, salps grow so fast that they can grow to maturity in 48 hours. They are thought to be the fastest growing multicellular animal on Earth, increasing their body length by up to 10% per hour. This quick turnaround time enables salps to take advantage of algal blooms, increasing their population size rapidly when there is a sudden abundance of food. Because of this, salps are very important for cycling nutrients through the different depth zones of the ocean. As they move up and down through the ocean eating and excreting they spread nutrients downwards to other ocean communities.